The west coast of Spain and Portugal has cooling winds which keep the air cool and make a journey a pleasure at any time of the year. The route assumes travel via Lisbon airport which has many international flights although it can adjusted for those using (O)Porto and Santiago de Compostela international airports. It is suggested that the first night is spent in Lisbon Where there are many hotels. We however suggest the small traditional Janelas Verdes hotel in the Embassy area near the river. The traffic congestion and signposting are bad in Lisbon. A taxi from the airport, in Lisbon itself and back to the airport to pick up a hire car is suggested. The first stop is two hours to the north staying at Quinta das Lagrimas on the edge of the old university town of Coimbra. Then continue north for two hours to the second city of Portugal, Porto and stay at the Pestana Porto hotel. This hotel is on the riverside in the UNESCO world heritage area with the famous Port Wine ‘Caves’ across the river. If an extra day can be managed here a trip upriver by boat to Regua is interesting with a return by train. The next stop should be in the Pousada at Viana do Castelo. This Pousada has a famous view looking past the church to the estuary of the River Lima. Time should be taken to explore the old sailing port of Viana do Castelo where the trade in ‘Portugal Wine’ first started. For those with time might like to include a night at the Parador of Bayona which can be reached by the old coast road with a ferry across the border river. Our route however goes direct to Santiago de Compestela to stay two nights in the magnificent 5 star Parador which may be the oldest hotel in the world. In the middle ages, Santiago was the third most visited pilgrimage city after Rome and Jerusalem. The Cathedral takes one side of the main square with the Parador on another side. It is one of the few hotels where it is recommended at least one evening meal is taken in the main restaurant. On the way back south on the motorway for two hours and spend a night at Guimaraes which was the capital when Lisbon was still occupied by the Moors. In winter, stay at Pousada Santa Mainha set in a magnificent old Convent on a nearby hill. Rather than a second night in Lisbon, there is an interesting three hour drive for the last night. Near the airport follow the signs to the new Vasco de Gama bridge and go to the Pousada PalmelaÂ in the castle which looks over the plain below. Back along the same motorway and bridge takes you back to the airport missing the Lisbon traffic. Many people travelling this route are ‘senior citizens’. Because of this, many hotels are in the famous Paradores of Spain of Pousadas of Portugal groups which use historic government owned buildings and it is possible to obtain discounts on the standard price. These luxury hotels are very affordable if one person per room an take advantage of the older persons discount which is 40% if over 55 in the Pousadas or 30% for the over 60s in the Paradors. Restrictions apply and they are subject to availability. There are also other promotions available for younger persons, such as 20% off the half board rate at a Parador if staying for two nights. Ask for the best price which has to be arranged at the time of reservation. All these hotels require credit card details which will only be used in the case of a ‘no show’. Payment is made to the hotel at the end of the stay on check out. The opportunity of visiting the Pousada Tavira in the eastern Algarve in Portugal was taken during the Easter break. This Pousada has recently been converted from the Convento da Graca ( Graca Convent ) and is the only one of three Pousadas in the Algarve region based on a historical building. The convent is on a hill in what was the old Jewish quarter of the town and surrounded by narrow streets. It was founded by King Sebastiao in 1569 and the excellent conversion into a hotel has maintained many of the original features including the Renaissance cloister and the baroque facade. The Convento de Graca now contains 31 rooms and five suites with a contemporary design but in harmony with the age of the building. It has a restaurant serving international and regional food, a bar, meeting rooms and a gymnasium. There are two swimming pools for adults and children with plenty of sunbathing area. A small museum contains Islamic artifacts which were found on the site during the conversion. This is a fine place to stay with standard rooms for two persons starting at 150 Euros in low season, rising to 250 Euros in August, which includes a buffet breakfast for two persons and taxes. The promotion which is most used by international visitors is a discount of 40% of the room rate if one person is over the age of 55. This is subject to availability and available from Sunday to Thursday nights except July, August and September. It is not available during certain national holiday periods. Tavira is a pretty town which was largely rebuilt after the earthquake of 1755. It is on both sides of the river Gilao which is linked using an old bridge. It has the nickname of â€œVenice of the Algarveâ€. The Pousada and the town contrast strongly with the concrete of the main tourism resorts in the central Algarve. Golfers have the benefit of the courses recently constructed in the area including Benamor, Monte Rei and Quinta da Ria. In addition the courses of Vilamoura, Quinta do Lago and Huelva region of Spain are within reach. About a mile away, across the salt pans are the deserted sandy beaches and villages of this part of the coast. There is a problem with the signposting to the Pousada. On the exit from the motorway are the familiar blue signs pointing to the Pousada that are in use throughout Portugal. Unfortunately the local mayor ( President of the Camara), for reasons best known to himself, will not permit them. In the town there are white signs to’Convento da Graca’. Visitors to the Pousada should be prepared to follow the signs of both colours and to both the Pousada and the Convento da Graca. Following these signs through narrow streets will bring you to this jewel of a hotel. Still time to take a short break at a Pousada this weekend. In February 2008 only, certain Pousadas of Portugal are offering an attractive discount. The prices for 2 nights, with breakfast included, vary between 120 to 200 euros depending on the Pousada chosen. These rates are for two persons sharing a room and includes breakfast. This promotion is attractive to all except where at least or person in the room is aged over 55 years where the golden days discount gives a 40% discount on the standard rate . The more expensive Pousadas are using the buildings of castles, old monasteries etc. – This promotion is limited by the rates availability. – Can not be accumulated with other promotions or special conditions, and is not valid for groups. – All rates include service charge, local taxes and VAT and are subject to change without prior notice. – Reservations paid by credit card will be automatically charged. – Reservation cancellation made with credit card are subject to a 9 euros penalty. – Cancellations: first night will be charged if the reservation is cancelled less than 48 hours prior to arrival date. – No-Shows: The entire stay will be charged. Our business on the Internet began over 10 years ago as a result of my pages for the cruising sailor on the Portuguese coast. The present business started as a means of saying ‘thank you’ to the Portuguese people for their kindness to me and my family when my business resulted in a move to Portugal. The initial intention to assist those in tourism in the less well known areas has been a great success with many million of Euro benefiting the local economy. The pages on Manor House tourism were quickly followed by the villas and cottages owned by the manor house owners. The success of the website meant that the Pousadas of Portugal and the Parador Group in Spain became our clients as they both operated hotels using the old buildings which is a feature of our site. Many satisfied guests have asked us to use our expertise to offer similar accommodation outside the Iberian Peninsula. To satisfy this demand we have recently launched a web site, in association with our French partners, to concentrate on the Chateaux in France. To qualify for inclusion, each Chateau must have high quality service and accommodation. Being France many also have a gourmet restaurant. We anticipate similar sites to be launched in the future in other European countries as we build up contact with local partners and research the accommodation available in each country. We want to continue our policy of offering the same price as booking direct, no extra for paying by credit card and no payment in advance if not asked for by the owner. Manor Houses Lda. is a registered travel agent, covered by bonds to the Government, however all money is transferred by you direct to the owner or his agent. We never make a charge for cancellations however there may be a charge by the accommodation provider for the reservation. We continue to think that an independent traveler can obtain the best rates through a specialist adviser or the service provider. For this reason we do not offer flights, car hire or travel insurance although there are links to other firms providing these services on our sites. Our youngest daughter flew on a low cost flight to spend a weekend with us in Lisbon which is one of her favourite cities. Although we live in Portugal, her journey time by air was considerably less than our road trip! Our first stop was for late lunch at ‘docas’ which is one of the old docks now being used as a marina with one side being lined with restaurants for open air and indoor eating. It is under the high level bridge across the river and the background noise of the traffic sounds like angry bees. Before the meal we had to have a drink at the Irish pub to see the end of a football match on Sky Television! We stayed at the five star boutique hotel, The Bairro Alto, which is the conversion of an old city stately home. It has an open air terrace bar with food and snacks on the top floor which looks over the city roofs to the river. We chose this hotel since it is central. Nearby is the Brazileira cafe where the famous Lisbon writers used to meet over 100 years ago. Also close is the ‘elevador’ which is a lift that takes you down to the main shopping area of the city. This was a change from our usual hotels of As Janelas Verdes and York House which are two small hotels in interesting old buildings in the quieter embassy area of the city. The following evening, we had a drink in the unusual Pavilhao Chines where the walls are covered with old collections of many themes. This was followed by a taxi ride up the hill on the other side of the city almost to the castle. Here we went to the Chaperto restaurant which is reached through a graffiti painted door and through a courtyard full of students. A spiral staircase leads up to the high class restaurant where we had a table in the widow with an excellent view of the nighttime skyline to accompany our good food. The next day we discovered Cafe no Chiado in Largo do Picadeiro near the hotel. An excellent small place for a snack or a light lunch. The afternoon was spent on one of the trams which took us down to the city and up the streets in the old area on the other side. After a coffee, we made the return journey. A more structured sightseeing journey (and more expensive) can be made by the tourist tram leaving from the square by the river. That evening we had another memorable meal in the A Travessa restaurant next to an old convent near the French Embassy. This is definitely a place to go by taxi since if you manage to find it, the parking is limited. Another night we went to a ‘Fado’ restaurant. The singing was excellent but when the bill came we found that we were being treated like tourists and I do not want others to share our expensive experience so the details are not given here. Next day it was time to say goodbye to my daughter and we had a meeting scheduled at the Pestana Palace hotel followed by another at the nearby attractive town of Sintra. The Pestana Palace is the flagship hotel of the group that runs the Pousada hotels and many of their promotional rates apply at this splendid hotel. What a difference was this visit to Lisbon compared with staying in one of the modern hotels. We did have the benefit of having been there before and the experience of someone who had worked in the city. Although the places were expensive by the standards of Portugal, prices were cheap compared to other European capital cities. Persons over 55 years can get a 40% discount at the fabulous Pousadas of Portugal. Combined with low cost flights, it is an excellent opportunity for a high class mid week break at little cost. The discount is available on single or double occupancy and only one traveller per room needs to be over 55. With this discount, the cost per person in a room for two, Sunday to Thursday, is approximately 36 Euros or Â£23. On Friday and Saturday nights, it may increase by 25 Euros as the Pousadas are very popular with the Portuguese and Spanish enjoying a weekend break. Another option is the Golden Age Passport which is available for 375 Euros. This gives vouchers for 5 nights accommodation Sunday to Thursday inclusive and also 25% discount off the bill in any of the 42 Pousada restaurants. There are more than 40 Pousada Hotels, many of which were formerly historic castles, monasteries, palaces, convents and other historic buildings. They all offer very high class accommodation and observe the best traditions of the regions where they are located. The Pousadas are located throughout Portugal and many are to be found in the lesser known, unspoilt areas. One such area is the Costa Verde (The Green Coast) in the north of Portugal. It is one of the most beautiful areas of the country although it receives more rain than the Algarve. The winter has an average of 5-6 hours of sunshine per day. This is a region of lush vegetation and small fields from which the area gets its name of ‘The Green Coast’. Spring is a good time to visit to enjoy the warm sunshine and pleasant climate. It is after the winter rain and before the heat of the summer. The colour of the blossom of the trees starts with the Mimosa in February which is followed by the flowers of the fruit trees. Two excellent Pousadas for a winter break in north Portugal are Pousada Monte Santa Luzia overlooking the delightful old sailing port of Viana do Castelo and Pousada Santa Marinha in Guimaraes, once the capital of Portugal. These Pousadas have been selected for their easy access to historic towns which can be enjoyed before the rush of tourists. Both towns have many cafes, shops, bars and restaurants and have easy motorway access to the airport. Porto (Oporto) international airport is in the north of Portugal and TAP fly here twice a day from London Heathrow. Ryanair have two flights a day from London Stanstead and they also fly from Liverpool. In the next few weeks there will also be flights from East Midlands airport near Sheffield to Porto. There are also flights to the main European capital cities. Also available is the Golden Age Passport which is available for Euro 375. This gives vouchers for 5 nights accommodation on any night except Friday and Saturday and also 25% off the bill in any of the 42 Pousada restaurants. These offers are available for most but not all of the Pousadas. They are subject to availability and are limited to certain dates excluding such as Christmas, Carnival, Easter and the summer months. Conditions apply. These discounts are available on single or double occupancy and only one traveller per room needs to be over 55. The Douro valley is the grape growing region for Port Wine and it has been producing wine since it was introduced into Portugal 2.000 years ago by the Romans. The wine is taken to the Port Wine ‘caves’ at the mouth of the river in Gaia which is on the south bank facing Porto (Oporto). It used to be a perilous journey down the fast flowing river in the traditional ‘Rabelo’ boats but in the 19th. Century a railway was built along the banks of the river and its tributaries. Now road tankers are used to transport the wine and the river is a series of dams with locks for boats to pass. Passenger trains are still running and the line is among ‘The Great Railway Journeys of the World’. These days the river is mainly used for tourist traffic including hotel boats taking a week to go across Portugal and return to Porto. The Port Wine growing region is very attractive and has a hot, dry micro climate. The large Port wine Quintas are usually painted white and their estates go down to the rivers edge. A little known fact is that the walled terraces were built by black slave labour. The slaves were later replaced in the vineyards by labourers from Galicia in Spain. The slaves have left no trace behind, not even descendents of mixed race. The Douro valley is an outstanding example of a traditional European wine producing region and has been declared a World Heritage Site. Further upriver is the Archaeological Park of Foz Coa which prevented the area being flooded when a proposed dam was built. It has also been granted World Heritage Site status by UNESCO. The accommodation in the area is limited but very diverse. Many visitors stay at the Pousada Vintage House Hotel overlooking the river at Mesao Frio. Another popular hotel is the Regua Douro Hotel. A famous Port Wine Quinta which has guest accommodation is Casa de Casal de Loivos which has spectacular views of the river below. Nearer to Porto is the recently modernised Quinta do Cao. An interesting self catering quinta for rent is Casa de Povoa which is an old Manor house looking down to one of the dams on the river. Near Pinhao is Casa Amarela which is located at the rivers edge on one of the wine producing quintas. Cottages with a shared swimming pool include those at Quinta de Santa Julia de Loureiro on a beautiful Port Wine producing quinta looking down the hillside to Regua. This area is truly spectacular and is not yet overrun with tourists. If you want to lie on the beach in the hot sun, the Algarve is the place for you. Many people however go to other regions which retain the original way of life unaffected by the tourist invasion. The Algarve is the most visited tourist region. It’s developed in a hot and arid region with spectacular beaches which was deserted before mass tourism by plane. I like to visit this area of concrete buildings in winter when it is less crowded and it is nice to speak English to everyone. Not being a golfer, I cannot enjoy the many courses for which the area is famous. However this Paradise for tourists is not the true Portugal. To the north of the Algarve, across the coastal mountains, are the vast hot roling plains of the Alentejo. The old towns on the small hillocks used to be defended by castles. 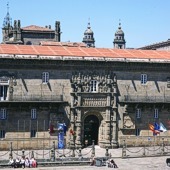 The government has converted many of these historical buildings into Pousada hotels. Furhter north is the vibrant capital city of Lisbon where the main inter continetal airport is situated. The city centre has many hotels and historical sights. The nearby old fishing town of Cascais with south facing beches is worth visiting. Not to be missed is Sintra to where the King’s Court used to move in order to escape the summer heat of Lisbon. It has many old palaces, some dating from the period when the Moors ruled most of south Portugal. The road to Oporto can include a visit to the old walled town of Obidos. If the Pousada is full, stay and have dinner at the inn, Casa das Senhoras Rainhas. Other places to visit on the journey include the modern pilgrimage sanctuary of Fatima or the old university town of Coimbra. Oporto, or Porto as it is known to the Portuguese, is an industrial town with many fine buildings. In spite of this it is well worth staying a couple of nights, The main tourist attraction are the Port Wine ‘caves’ on the south bank of the river. I like to stay at the Pestana Porto hotel which is in the old riverside area in an UNESCO World Heritage Site. Oporto has an airport with flights to most European capital cities. Upstream from Porto is the area in which the grapes for the Port Wine (capital letters by tradition) are grown on terraces going down to the river Douro. In this region it is possible to stay at some of the beautiful quintas. One of my favourites is Casa de Casal de Loivos near Pinhao. I like the Alto Minho in the far north, an area not known to many tourists. This view is obviously shared by the Portuguese who chose the area to build their Manor Houses in previous centuries. There are few hotels but some Pousadas and many of the manor houses offer accommodation for paying guests. They also have tourist accommodation in modernised cottages. This area of small fields, green valleys, high hills, old towns and Celtic traditions has many villas for rent. One of my favourites is Casa de Olival near the old town of Ponte de Lima. The old roads of ten years ago have now been replaced by fast new motorways and it is now possible to go from north to south of this interesting and beautiful country in a few hours.